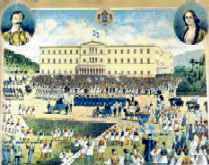 On September 3rd 1843 a great revolt of the population and guard of Athens occurred, with leading political and maximum officers. They had preceded long secret consultations in the house of general Ioannis Makrygianni. The administration of army then had undertaken the general Dimitris Kallergis. In the demonstration front by the palace they required from Othona and achieved the concession of Constitution. The last one had not granted constitution, despite the forecast of settlement in 1832 and pressures of "parties" (English-French). From this historical event the square of Constitution received its name.